The last thing we need at this critical time is sniping at the leadership from the left! With a general election possibly on the horizon, the Establishment propaganda assault on Jeremy has already started. Odious right-wing propaganda sheets have been noticeably upping their anti-Corbyn smear-ridden stories over recent days and weeks. The last thing we need at this critical time is sniping at the leadership from the left! Over the months we have repeatedly witnessed Jeremy’s extraordinary will and courage being tested in the most extreme of ways — and we are hard-pressed to think of any present-day politician who would have been able to withstand the ferocious onslaught that the Establishment has unloaded on to him — and continues to, as we write. But the very idea of a “perfect” leader always was a fiction and every mortal human being will have weaknesses. This allegedly “weak” leader has inspired a huge, unprecedented surge of new party members (who else could conceivably have brought hundreds of thousands of new members into the party? — Chuka Umunna; Dan Jarvis; David Miliband? ); forced embarrassing U-turns from an arrogant, uncaring government; shifted the political centre of gravity in Britain significantly to the progressive left; brought morality, fairness and peace into previously moribund political narratives; performed very well in local elections before the putsch last summer by the Parliamentary Labour Party (PLP) elite; has consistently out-performed Theresa May at Prime Minister’s Questions in recent weeks; has had the courage to take a nuanced, thoughtful view of Brexit — rather than adopting a tabloid-esque, grandstanding “pro” or “anti” position — and has remained dignified and calm in the face of daily vituperative attacks from the media, the entire Establishment and even his own party. 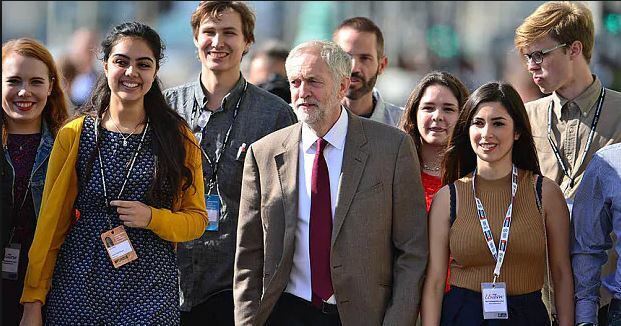 Rather than using any weaknesses Jeremy might have to criticise him from the left, everyone around him should be doing everything possible to complement the brilliant and unique qualities that he does possess. He has been bullied, betrayed and ridiculed, and yet he carries on with the same grace and care he always shows to others — however objectionable their behaviour and treatment of him might be. The genuinely warm send-off Jeremy recently gave to resigner and serial Corbyn-critic Tristram Hunt is a case in point. We also know no other politician in this country who possesses the maturity and dignity to have walked out of the unprecedented PLP meeting of June 27 last year with all its scarcely believable bully-boy nastiness directed viciously at him and to immediately urge his many thousands of supporters in Parliament Square to act respectfully, even to those we disagree with. 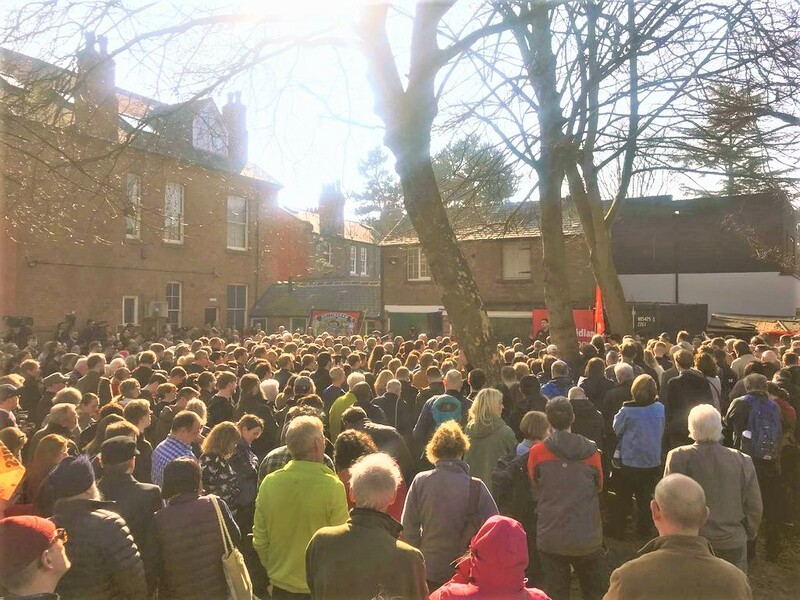 In the months and years to come, it is our strong conviction that it will increasingly dawn on more and more people that in Jeremy we’re looking at a deeply powerful and courageous human being. No other Labour leader would have had the strength to withstand the relentless assault that Jeremy has had to endure from all quarters since he became party leader. Nobody else in the PLP could have rescued the Labour Party from the jaws of neoliberalism as Jeremy has; and his proud place in our class’s history is already assured for having made a genuinely socialist party electable for the first time in our living memory. “It’s too easily forgotten that the deserters are the same people who never accepted Corbyn’s leadership of the party from day one, and who’ve continually done everything possible – eagerly aided by their establishment media friends – to undermine him at every turn, so making his leadership job quite impossible. “Remember the attempted MPs’ coup led by these people in their unconstitutional attempt to get rid of Corbyn? – this was long before the Labour Party anti-Semitism hysteria had ever been heard of. “And having failed to displace Corbyn with their spiteful coup attempt, their fall-back was to concoct a carefully choreographed plan: namely, create a hysterical (but fictional) media storm about anti-Semitism; allow it to rage for a few months; then re-kindle it (literally making it up as they went along); and finally, when the fire was raging again, use this as a baseless pretext for splitting the Labour Party so we can have another five years of heartless Tory rule. Establishment job done. “These “courageous” people have discharged their quasi-Tory bidding very well. “One thing that May and Corbyn do have in common is that at least they’re trying to stay true to the democratic result of the EU referendum. He concludes that – rather than having to devote huge amounts of time and energy defending themselves from relentless attacks from ‘serial underminers‘ within their own party – Corbyn and his team can now spend all their time on exposing the nation’s headlong social disintegration under Tory austerity. Anna Boyle has listed forty reasons who the leader and/or the party reasons illustrating the truth of his statement which may be read here. Those who have difficulty in accessing them may ask for an attachment, using the Comments facility. After describing actions taken before Jeremy Corbyn was elected as party leader – including his leadership of a clean-up and vigil at Finsbury Park Synagogue which had been vandalised in an anti-Semitic attack – Anna points out Jennie Formby, after her appointment as general secretary of the party last year, selected a highly-qualified in-house Counsel. By 2018 the size of the party’s staff team handling investigations and dispute processes had almost doubled. The entire backlog of outstanding cases was cleared within 6 months of Jennie taking up her post. MP Margaret Hodge – a leading critic – said that she had submitted a dossier of 200 examples of antisemitism. Ms Formby commented that those complaints referred to 111 reported individuals, of whom only 20 were members. Smaller panels of 3-5 NEC members were established to enable cases to be heard more quickly and every complaint made about antisemitism was allocated an independent specialist barrister to ensure due process is followed. “I’ve had a very interesting week in politics. I’m obviously very sad at some of the things that have happened and very sad at some of the things that have been said. Walking away from our movement achieves nothing. Not understanding where we have come from is a bad mistake. “Because when people come together in a grouping, in a community like the Labour Party, there’s nothing we can’t achieve together for everybody . . .
“Labour, for me, is my life – and I’m very sad at people who have left our party. I really am. I say this to them: in June 2017, I was elected on a manifesto, Emily was elected on a manifesto, Richard was elected on a manifesto, Gloria was elected on a manifesto – it was the same manifesto . . . the Labour Party believes in equality and justice, that is what was the centre of our manifesto, and that will be at the centre of our next manifesto . . .
“When the media talk about the bravery of those who walked away, Anna Soubry voted for austerity and said it was a good thing. Almost immediately after leaving Chris Leslie tells us that we should not be ending university fees … and we should be cutting corporation tax and increasing the burden on others. Earlier this month the FT warmed to the shadow chancellor. 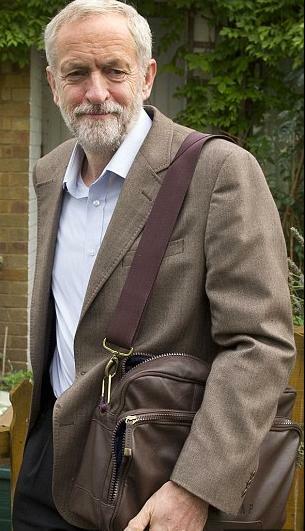 Following Jim Pickard’s first respectful report on any aspect of Labour policy, an article, by Jim O’Neill, chair of the Chatham House think-tank and former Treasury minister, had the headline, “The UK opposition steps into an economic void left by a government grappling with Brexit”. Following a couple of caveats, O’Neill writes: “In at least six policy areas, which Mr Corbyn and his shadow chancellor John McDonnell are treating as priorities, businesses and the government need to catch up (detail here)”. The first area on which Labour sees clearly is Britain’s productivity crisis. Second is the orthodox belief that lower corporation tax will magically boost investment spending. Third, risking large amounts of money on fixed investment no longer appears attractive. Fourth, businesses need to rediscover profit with purpose. Finally, there is the housing crisis. But today there was a decided change of direction – had the editorial board been leant on? Mr McDonnell’s most eye-catching announcement was a compulsory share ownership scheme. Employee ownership and other profit-sharing schemes are by no means outlandish. Many businesses already choose to run them in order to recruit and motivate their workforce. There are also sound political reasons to give employees a greater share of ownership and a bigger voice on boards after a decade in which wages have remained stagnant in real terms. But companies should not be coerced into taking such action. Mr McDonnell claims these proposals are designed to tackle Britain’s productivity crisis – the evidence for this is sketchy and outdated. It could increase the cost of capital and deter investment. As the scheme would bear only on employers with more than 250 workers, it could also disincentivise growing businesses. There is a real danger that Labour’s prescriptions may end up only harming the patient. Businesses (and many voters) are concerned that the proposals on the table may only be the tip of Labour’s interventionist ambitions. “Nationalisation, dilution of shareholdings, workers on boards, sweeping trade union powers — John McDonnell’s economic prospectus for Britain is the Labour party’s most radical in several decades. The shadow chancellor further developed the party’s socialist credentials in his address to its conference in Liverpool on Monday. He senses that the appetite for change is great enough to take Labour into office on a hard-left ticket at the next election”. And: “Labour’s policies do speak to the mood of many voters. Many Britons believe inequality is growing, public services are collapsing and the excesses of capitalism need taming”. Though not as wholehearted as the conclusion of former Treasury minister O’Neill: “Dealing with the UK’s deep-seated economic problems requires sustained thinking and attention, not just occasional lip service. The Labour Party has stepped into the vacuum left by the government and appears to be offering the radical change that people seek”. Looking forward to a rise in the number of companies with 249 employees, if any stay in the UK, should the nightmare come about at the next election ( Ed: as share ownership proposals apply only to companies with over 250 employees). The shadow Treasury team admits that private, unlisted companies could not be compelled to hand out dividends to workers. In theory that could incentivise public companies to delist from the stock market. The next problem is that foreign-listed companies will not be obliged to hand equity to their UK workforces. Again, that could provide an incentive for London-listed companies to switch their listings to an alternative financial centre such as New York or Frankfurt. Nor is it clear how the British government could force an overseas company with a London listing to comply with the scheme if most of its workers are abroad. One group of workers who could feel aggrieved by the proposals are those in the privatised utilities such as rail and water. Labour is determined to nationalise the utilities, and admits that — as state workers — staff would no longer be eligible for the share scheme. At present a third of employees in United Utilities participate in their employee share scheme, as do two thirds of South West Water employees and 70 per cent of Severn Trent’s UK employees. Another complication is that some companies could find alternative routes to rewarding shareholders, for example by carrying out share buybacks instead of dividends. We don’t think enough about local government, one of whose jobs it is to mend potholes. When in our own lives our nearside front tyre is shredded, the pothole, Parris believes, represents “a momentary twitching-back of one tiny corner of a great curtain, behind which lie, no, not potholes, but a million anxious human stories, caused in part by cuts in public spending”. or the end of a vital local bus service. Potholes are a parable for others that matter even more. Unfilled potholes put lives at risk and have become a symbol of the damage done to every walk of life by spending cuts. All the pressures on those who run government, local and central, are to worry about the short-term. it is usually possible to leave issues like road maintenance, decaying school buildings, rotting prisons, social care for the elderly, Britain’s military preparedness or a cash-strapped health service, to tread water for years or even decades. “They’ll get by,” say fiscal hawks, and in the short-term they’re often right. and road users can dodge potholes. “When New Labour was elected in 1997 we Tories groaned as it tipper-trucked money into the NHS, school building and other public services. Thirteen years later when Labour left office the undersupply was monetary, the red ink all too visible”. Parris asks: “Must we forever oscillate like this? One answer: Green & Labour Party leaders would meet these needs and avoid red ink by redirecting the money raised by quantitative easing. The Times’ Twitter account directed readers to fake news linking a supposed Labour Party membership slump to recent trumped-up antisemitism claims by hostile organisations. “In fact, Labour’s latest membership figures show new members joining at almost three times the rate of actual resignations, although there was a slight lull at the height of the antisemitism slur”. Labour Party infiltration? Have agents – yet again – been ‘planted’ to protect vested interests? Mainstream media and careerist politicians are continuing to use those whom Jenkins described as “the Blairite retreads in his own party” to discredit the Labour leader whom many view as the country best, indeed – at the moment – only hope. Today the Murdoch Times has its usual set of articles smearing Corbyn, who would not promote vested interests if elected. A peacemaker with concern for the least fortunate is so bad for business. But has it gone further? Are the individual party members who make misogynistic, racial or anti-semitic remarks, infiltrators? The use of arms-length agents is on record and further information about their activities continues to emerge. As many, including Dominic Casciani, the BBC’s Home affairs correspondent have reported, during the 40-year history of the Special Demonstration Squad – the unit at the heart of many of the allegations – police officers used 106 “covert identities”. Environmental and anti-war protestors were filmed, their mail and phone calls intercepted and undercover police officers (left) deployed to infiltrate protest movements. Casciani confirmed that official reports had revealed the existence of some of these undercover officers – such as the one who was in a campaign group close to the family of Stephen Lawrence – who helped a senior officer to prepare Scotland Yard for the public inquiry into the London teenager’s murder. He reported on the legal position adopted by the police and other security agencies in cases involving protection of undercover officers or sensitive sources: “Neither Confirm Nor Deny”. And on Twitter, he speaks for himself: “I have written to the Board of Deputies and the Jewish Leadership Council. I will never be anything other than a militant opponent of antisemitism. In this fight, I am an ally and always will be. Labour is an anti-racist party and I utterly condemn antisemitism, which is why as leader of the Labour Party I want to be clear that I will not tolerate any form of antisemitism that exists in and around our movement”. Will this man’s integrity shine through the miasma of accusation and – as has happened to date – will he emerge all the stronger? Many fervently hope so. Should the Green Party join Corbyn Labour and fight together for social justice and for the planet? Owen Jones suggests that the Green Party should join Jeremy Corbyn and fight together for social justice and for the planet: “For those attracted to the Green message of a “peaceful political revolution” to end austerity, Corbynism seemed like a natural new home”. “It’s exactly the arrangement that has existed between Labour and the Co-operative Party for nine decades: indeed, there are 38 MPs who belong to both. Rather than proving the death of green politics, such a pact would give it new life”. In an act of political sacrifice at the last election, the Green Party stood down candidates across the country to avoid splitting the left-of-centre vote. A pact could be made, creating the sort of relationship the Co-op Party has with Labour, with dual Labour/Green membership. “Lucas herself has been a committed fighter for causes that must be central to Labour’s message. She was right to criticise pre-2015 Labour for failing to challenge the “austerity message”, and has opposed cuts to everything from women’s refuges to schools. Her courage in fighting climate change led to her arrest at an anti-fracking protest in 2013.In many ways, her campaigning zeal echoes that of Corbyn, who she has repeatedly fought alongside. Indeed, it is hardly controversial to point out that Corbyn is closer to Lucas politically than he is to many of his own MPs, and yet absurdly Lucas is a political opponent”. “A red-green alliance is surely overdue. this could be the makings of a formidable political alliance to defeat Toryism and form a government to eradicate social injustice and help save the planet. And surely that prize makes the pain of overcoming partisan differences worthwhile”.